As a conductor, arranger and pianist, Sam Davis is no stranger to Broadway – nor to PS Classics, where his talents have been highlighted on such diverse discs as Philip Chaffin’s When the Wind Blows South and the label’s acclaimed restoration of Kitty’s Kisses. As a composer, he supplied the bewitching title track for Rebecca Luker’s 2009 disc, Greenwich Time. 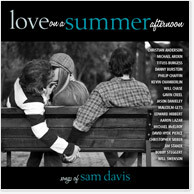 Now, Sam's prodigious compositional skills are celebrated with an entire collection of his songs, LOVE ON A SUMMER AFTERNOON. An elegant, classic melodist in the tradition of Kern and Rodgers, Sam evokes a wistful, elegiac yearning through his music: a romantic ambivalence that informs not only rueful, soaring ballads like "Goodbye to Boston," "Greenwich Time" and the title track, but also more playful items such as "Love Is a Chance You Take," "Old Blue Sweater" and "Invested in You." The best Broadway vocalists have been showcasing Sam's songs for a decade, on stage and in cabaret; now, a cast of theatrical all-stars – Christian Anderson, Michael Arden, Tituss Burgess, Danny Burstein, Philip Chaffin, Kevin Chamberlin, Will Chase, Gavin Creel, Jason Danieley, Malcolm Gets, Edward Hibbert, Aaron Lazar, Michael McElroy, David Hyde Pierce, Christopher Sieber, Jim Stanek, Bobby Steggert and Will Swenson – have come together to debut his songs on disc.